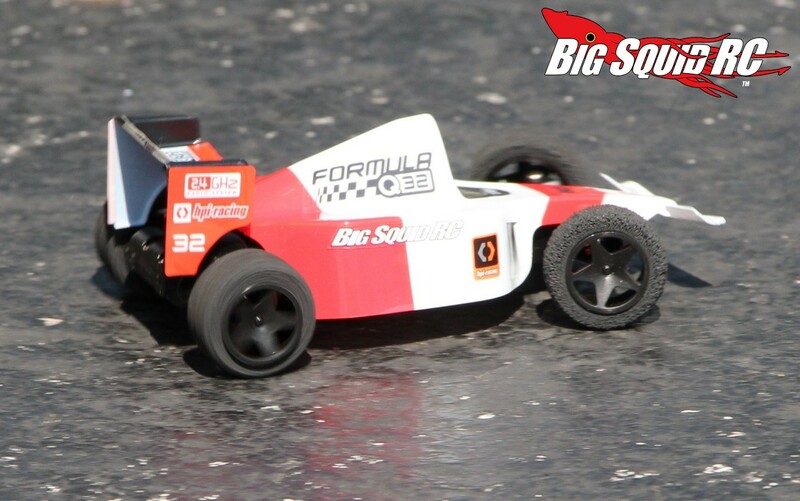 HPI Racing Formula Q32 Review « Big Squid RC – RC Car and Truck News, Reviews, Videos, and More! Primary Competition: For competition you would be looking at cars like the ECX KickFlip and BeatBox. What’s Needed To Complete: The Q32 comes with everything needed to get up and running except four AA batteries for the transmitter. You will have to sticker the car, plus mount the body and wing. Build Quality: We actually had two test samples and could find no fault with the build quality of either car. 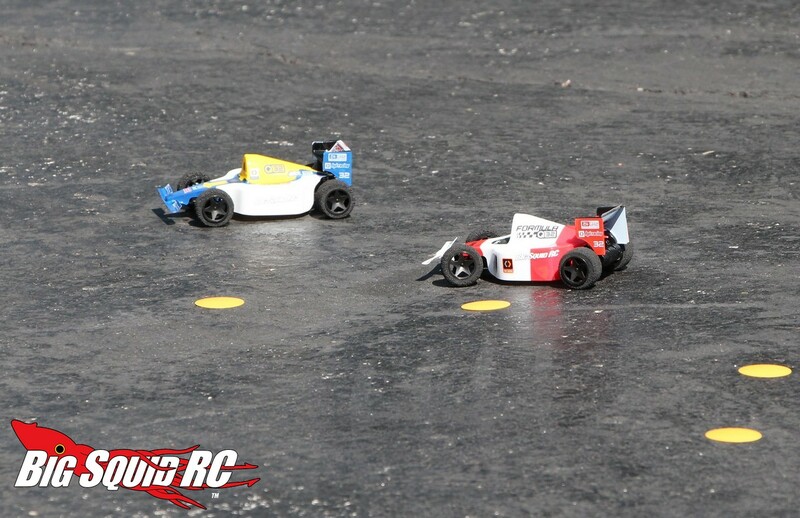 Test Drivers: Robbie G., Iron Mikeee, THE RC Kid, T-$$$, and yours truly. Test Venues: A carpeted man-cave, a paved driveway, and a cul-de-sac. 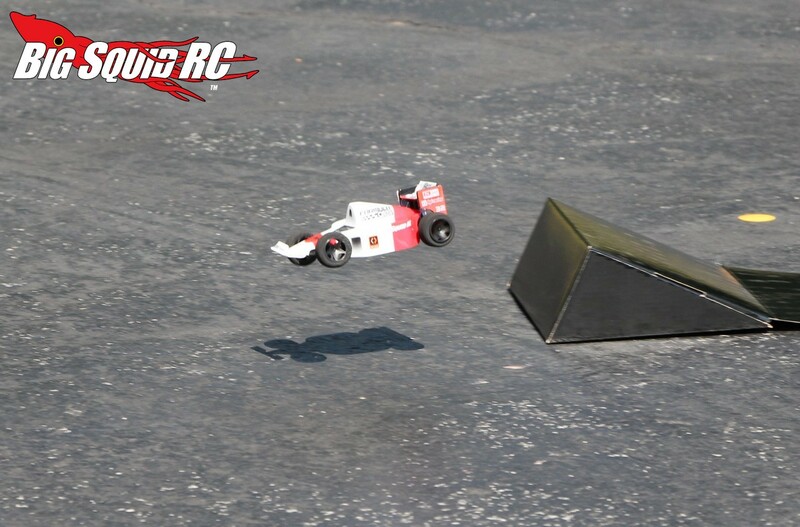 Set-up Notes: Our Bash Crew didn’t make any changes to the little HPI during testing. We used the transmitter to charge the included car battery. Four MaxAmps AA cells were used inside the transmitter. Turning: So what’s up with that HPI Real Steer? Well, a lot of ultra small scale cars don’t have proportional steering. The Real Steer on the Q32 is proportional. If you only need 1/4 steering, you can have it. Or 1/8, or 3/4, or full steering. The proportional steering on the Q32 truly does help it drive better, and not just in corners, but even when going straight. 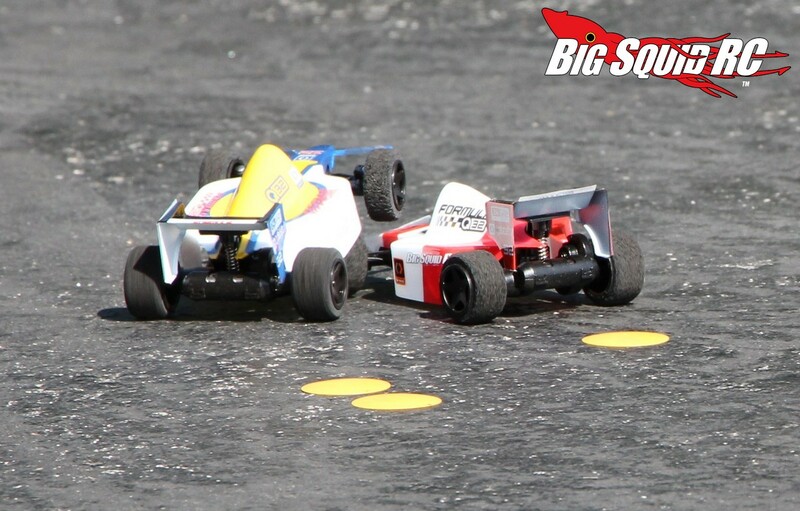 While hitting corners we were surprised on just how well the smallest HPI handled them. The foam tires did an excellent job on all the surfaces that we tried, plus the Real Steer made it a pleasure to go from tight hairpins to wide sweepers. By the way, we found that the best way to corner with the Q32 was to come in hot, ease into the brake, then to roll on the throttle at the apex. Yes, that is a pretty standard way to corner, but on the Q32 if you pounced on the throttle too quickly after the apex, the car would sometimes spin around. The car doesn’t use a diff in the rear, hence the reason it would spin when standing on the gas hard. Otherwise, if you gently ease into the throttle coming out of a corner, the little Q32 would stay absolutely planted. 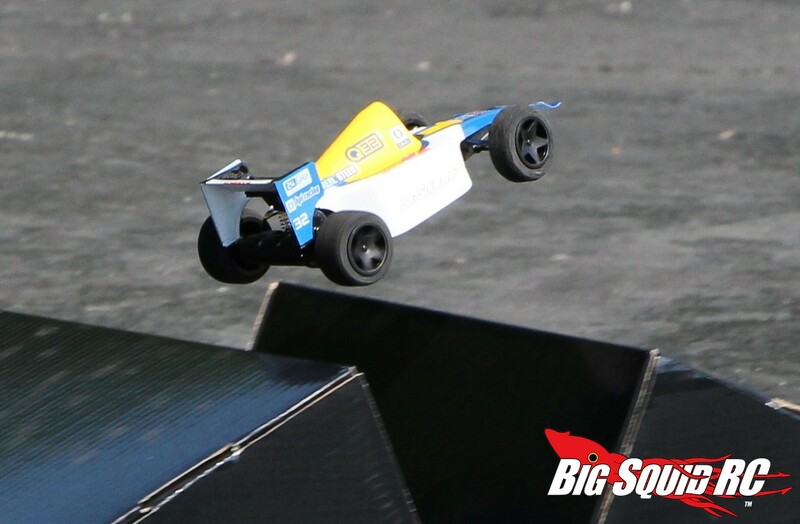 Jumping: Did we mention that the Formula Q32 comes with a ramp inside the box? It sure does and we had a blast using it. Yes, we know its a Formula 1 style car. Yes, we know it is a tiny 1/32 scaler. And yes, we know it basically has no suspension. However, it seems nobody told that to the actual car itself, it actually jumps decently. We expected it to have a hard time getting any air at all, but that was not the case. We also expected it to land like a load of bricks, that was not the case either. While not in the same league as larger cars, we had a blast catching air with the Q32 and it performed better in the air than any of us would have guessed. Bumps/Whoops: Bumps are definitely not the Q32’s strong suit. It is a small car with little in the way of suspension, so even small road joints were massive bumps to it. Amazingly, we found the rear to be decently suspended, it didn’t tend to bounce around too much, even if it was just a spring. The front was a different story as most of the car’s bouncing came from the front end of the car. On-Road: A nice smooth stretch of pavement is perhaps the optimal place to drive the Formula Q32. It has to be smooth, quite smooth actually, but once on that surface the Q32 rips hard for its size. Our test units never traction rolled and we were able to put them very close to the exact line we were shooting for, something that is normally quite hard to do on such a small scaled vehicle. To boil it down, we were super impressed with its overall driving on-road. Grass: Nope. If grass is your thing look for one of the larger offerings from HPI like the Jumpshot MT. Tires: We were huge fans of the stock foam tires. The tires provided incredible amounts of grip on the short carpet of our man-cave, but also impressed elsewhere. On dusty concrete they were actually able to provide respectable grip, a fact that is rather astonishing. They also did incredibly well on pavement. We didn’t think we would like them, but found out the foams were an outstanding pick for the Q32. Power: Ya know, we thought there was no way in heck that the Q32 would have any power, but we were wrong. 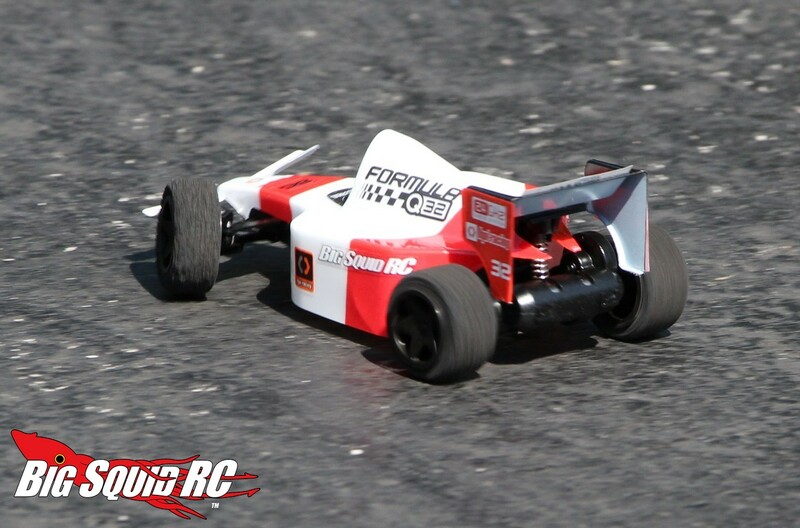 No, it isn’t 6S HPI Flux Savage kind of quick, but it had a lot of power for its size. Our GPS unit weighed more than the car so we weren’t able to get a mph reading, but we would guess it to be around 15. 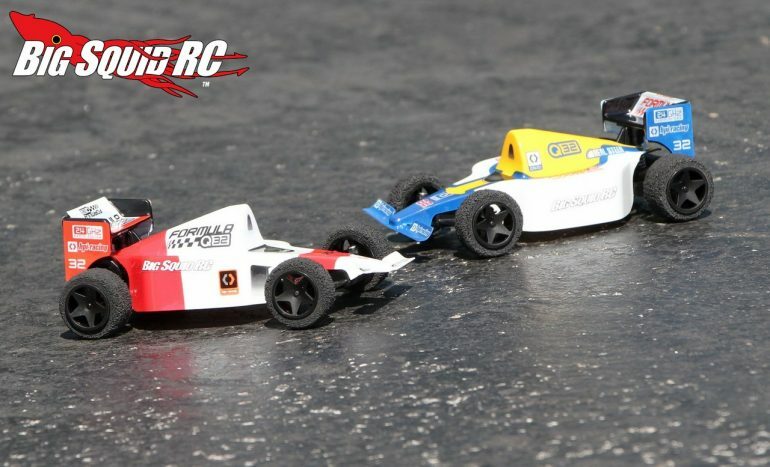 15 mph isn’t “fast” per se, but it is seriously hauling on a 1/32 scaler. It had plenty of punch right off the bottom and kept pulling hard up to its top speed. It had enough power to catch decent airtime. In fact, we could sometimes pull wheelies when landing from jumps. 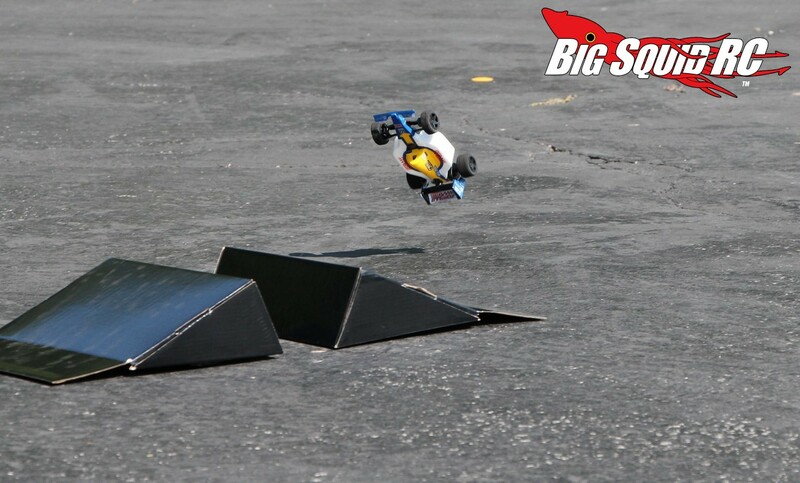 We felt like the HPI had more than enough power when used in a 20 foot by 20 foot area. Radio: The radio is on the small size but worked fine for all of our test drivers. 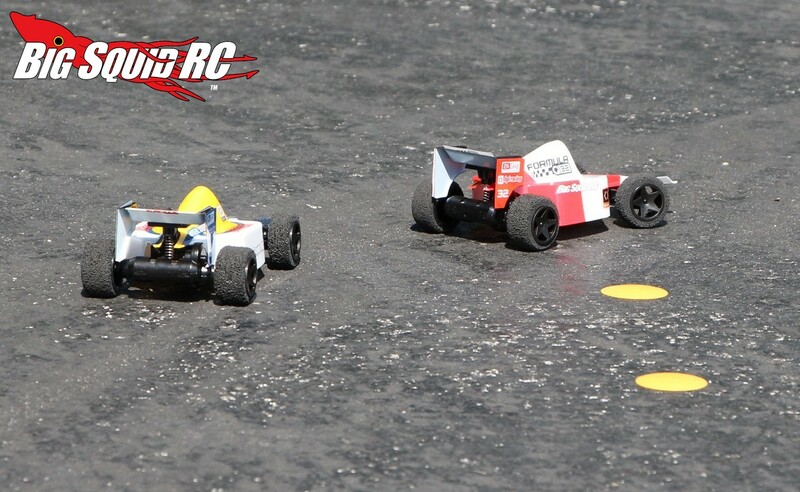 Our smallest driver was THE RC Kid who is 9 years old, he loved how the radio felt. Our largest handed driver didn’t have an excess of room for his hand, but did not complain about it being too small. Otherwise, we didn’t have any glitching or range issues. In case you didn’t know, the transmitter is used to charge the car, a fact that came in extremely handy when packing the Q32 along with us on various trips. Broken Parts: Nope, we didn’t break anything on our review cars. Not only are they lightweight, but they are made from flexible plastic. That combination resulted in a car that we could smash all day long without ever breaking a part. We did manage to knock the wing off of both cars, but as far as parts go, we simply didn’t break any. Yes indeed, inside the box you’ll not only find a ramp, but also some track dots. The dots are used to help mark out a course and were a nice addition to the package. We found charge times off the transmitter to be just over 1 hour. For runtime, we were getting around 11 minutes. With a pair of the cars we were able to get in plenty of driving time, but wished the charging process would have been a bit faster. Need a reason to pick up the Q32? Man-cave racing! We literally spent hours battling it out like Sebastian Vettel vs Lewis Hamilton in our man-cave. This was only possible because of how well the Q32 handled. We could create a course and actually follow it thanks to the Real Steer system. The foam tires stuck like glue and the ample power made the cars a total blast to race against each other. Best Mod: HPI has various hop-ups on the way for the Formula. Personally, we would like to try to the taller gearing to see just how fast we could get the car to go. Time To Bash: B Nope, it doesn’t take long to get the Formula Q32 up and running. While the car is charging you can sticker up the body & wing, then use the provided Velcro and double sided tape to attached them to the chassis. Once finished, you are ready for some serious man-cave racing action. Workability: A We really don’t give an “A” in this category, but because the Q32 is so simple, we found it ridiculously easy to wrench on. There might be a dozen screws total in the car and everything is right out in the open and easy to get to. Car Show Rating: B While the look of the Formula Q32 isn’t to scale, it does have more of an Asian cartoon style. 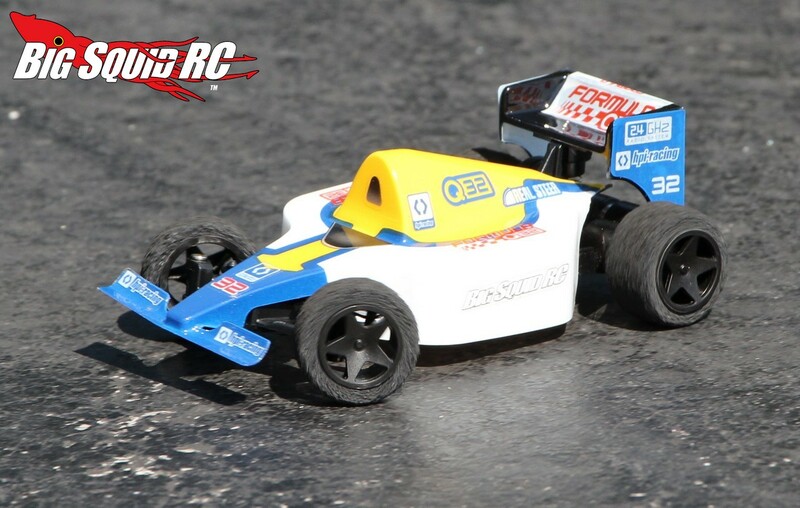 Our test crew felt like that style worked well with the small size of the Q32. Bash-A-Bility: A Our test units simply did not break. Kudos to HPI on this one, the Q32 can truly take a severe beating with minimal wrenching afterwards. The Formula Q32 is one of those rare cars that you can hand over to anyone without fear of them breaking it. Fun Factor: A Maybe it was the small scale, maybe it was the surprising amount of power that it had, but our test crew had an absolute blast testing the Q32. Better still, while you were waiting your turn for the transmitter, the Q32s were great fun just to watch, something that can rarely be said of other cars. Handling: B The Q32 handled surprisingly well for a car of its stature. Ok, so we realize that part of the allure to the Q32 is its ultra-low price point. However, if it just came with a rear diff and some front suspension it would handle even better. Value: A Only $54 for this amount of fun? Heck yes, that is an outstanding deal to us. Parts Availability: N/A As the Formula Q32 has not hit the market yet, we simply can’t give it a rating on this category. BigSquid Rating: A- Outstanding! 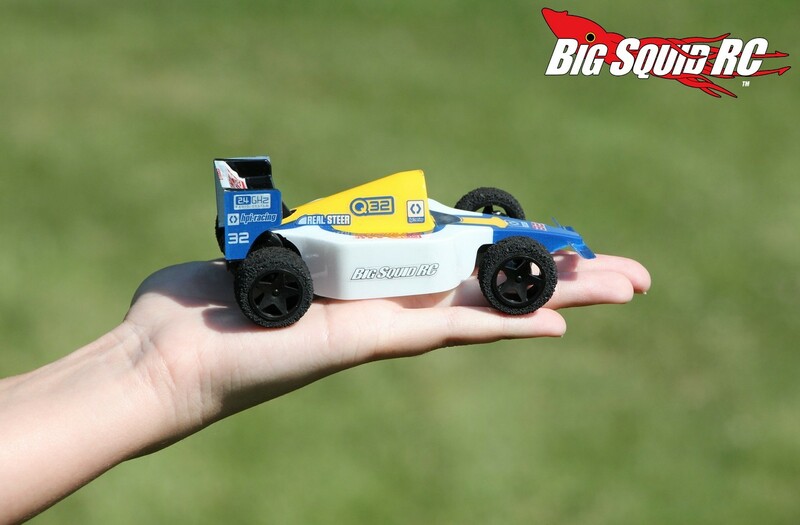 While not for everyone, the HPI Formula Q32 is perhaps the best 1/32 scale car on the market. We found it to be extremely durable and a pleasure to drive. We had some of the best times ever while testing the Q32 and can very highly recommend it to you.